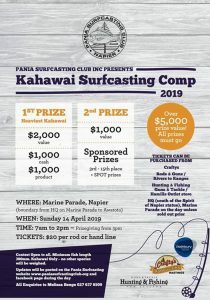 Awesome effort from Team Pania at the Surfcasting Nationals. Didnt quite take the Top Club award, coming 2nd to our mates at Feilding but some awesome results for us. Well guys what a massive 2 weeks up the Far north for the NZACA Nationals and then the bonanza!! In the days leading up to the Nationals the fishing was really hot!! Big tides on the 90, (3.4m highs and 0.2m lows) had the fish biting most of the day, even in the bright sunlight. Fish ranged from 2.5kg to Matty’s PB at 7.8kg with a lot of 4-6kg fish. We took Tim, Estella and their boys down the 90 to teach them a bit about fishing the 90 and surf beaches in general. Great to see Estella bag her biggest ever trevally at 5.2kg and Tim wrangled a 6.1kg snapper. Love seeing guys catch good fish!! Nationals fishing was a 35hr overnight affair. Plan was for myself, Matty and Tony to head out early (430am) on the 90 and swing back about 10am to pick up the rest of my family. 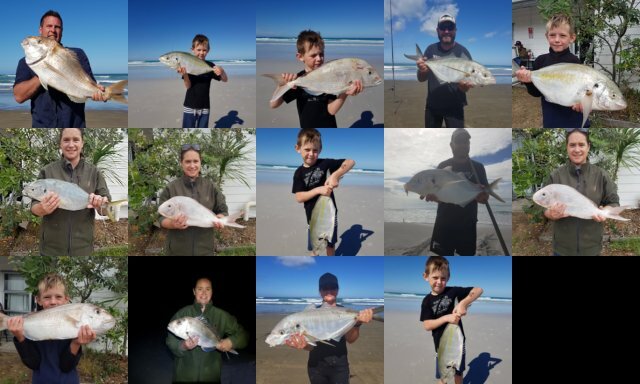 We caught a few nice fish, snapper and trevally up to 3.8kg. We picked up the family and headed up to Great Exhibition bay, fishing was a bit slow during the day but once the sun went down it went off the hook with snapper and trevally smashing the baits. Really proud of my wife who caught her first snapper off the beach from her own casts!! She ended up with 5 snapper and a trevally!! Xavier was on fire as usual and bagged a massive trevally that tipped the scales over 4kg!! All 5 of us binned out on snapper (5 each) and caught 14 trevally between the 5 of us!! Epic fishing!! Prizegiving and Xavier won the Junior fishing and Melissa came second in the open womens fishing and Matty took a $500 half share with an average weight snapper!! Bonanza Time!! Fishing for the week was pretty hard. Generally first cast was the gold then the sun peeked over the dunes and the fish went with darkness!! Fishings only part of the week and catching up with mates who we haven’t seen since last bonanza is always good. Drinks were poured and yarns flowed!! Congrats to all the winners and we’ll see you all next year! !